Laminate flooring can be a convenient and economical alternative to hardwood flooring or tile. However, there are certain tips that should be followed in order to ensure that the laminate flooring is maintained in order keep its original beauty. By following these steps, laminate flooring will remain vibrant and durable for much longer. With laminate, it is less necessary to clean with strong or harsh chemicals than with other surfaces. The most important step for maintenance is removing major debris and dust that can cause scuffing. This should be done with a soft-bristled broom or a dry mop. Harder brooms or brushes may scratch the surface of the laminate. Regular upkeep of this step will go a long way in reducing the visible wear and tear of laminate flooring, especially in high traffic areas like kitchens. For instances when it becomes necessary to clean the laminate more thoroughly, warm water does a great job of removing stains and dirt without stripping the surface of the laminate. This process is not as necessary in terms of general upkeep and can be performed a few times per year or whenever major stains develop. Use warm water to wet a mop and gently swab the laminate. 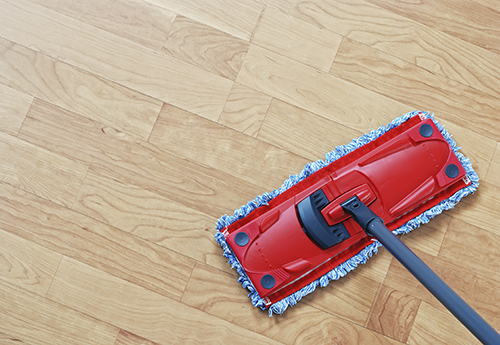 This will remove dirt, debris, and any stains that have accumulated on the laminate. If possible, it is best to dry the floor after the process to avoid attracting dirt or excessive wear on the protective coating. If water alone does not provide adequate cleaning of certain areas, mild solutions of water and vinegar or water and soap can be used to cleanse the laminate. It is important to only clean small areas at a time since both vinegar and soap can wear away at the coating on the laminate. The area that is being cleaned should be thoroughly rinsed and dried before moving to other areas to avoid stripping the laminate. For those occasional stains or marks that are difficult to remove, it is possible to use various different solutions to clean laminate floors. Some of these solutions include using window cleaner for stains such as blood or grease. Erasers are great way to remove scuff marks from shoes. Nail polish remover can also be useful for tough or sticky stains but should be used carefully in order to avoid dissolving the protective layer of the laminate.